Tiny churches are adorable symbols of understated Christianity. For the small communities that built them, they are perfect for small weddings or quiet contemplation. For frazzled travelers, fending off road rage or interstate ennui, wee houses of worship poke up suddenly from the asphalt firmament like little miracles. How many tiny churches can one fit on the head of a pin? As grizzled road trippers, we can't spend too much time on such a dainty pursuit, since its logical terminus lies somewhere in the subatomic. Theologians can debate that one -- we're just trying to snap a photo inside the Lord's houselets without elbowing a stained glass window. On cross-country trips, one of our ongoing missions has been to visit the smallest roadside church in the United States. ...because there must be rules. Yuma, Arizona: Built by a farmer on the edge of his fields, in honor of his wife. It measures roughly 7 ft. x 12 ft. inside. A sign on the dirt road that leads to the church reads: "Stop, Rest, Worship." Forestville, California: Missionary Independent Spiritual Church is a former bus stop refurbished as a place for spiritual contemplation. Reverend Miss Catherine offers daily candle lighting, along with palm and tarot card readings. South Newport, Georgia: The still active Memory Park Christ Chapel is called the "Smallest Church in America." Built in 1950, it measures 10 ft. x 15 ft., has space for 13 people, a shrimpy pulpit, pews and a stained glass window with just enough space for Jesus. Nashville, Illinois: The inside walls are covered with Bible verses scrawled on bits of plywood. No pews -- just a padded piece of wood for kneeling in front of a floor-to-ceiling cross. Elk Horn, Iowa: Morning Star Chapel is on the property of the Danish Immigrant Museum in Elk Horn. The tiny church contains four small pews, and altar and pulpit, and measures 6 ft. x 8 ft. It was built in 1951 by Charles Johann Walensky. Festina, Iowa: St. Anthony of Padua Chapel claims to be the "Smallest Church in the World," or is in denial about the loss of that claim decades ago. 12 ft. x 16 ft. interior, 40 ft. steeple. Waukon, Iowa - "The Chapel of Memories" was originally built by Mr. and Mrs. Chester Hastings of Waukon. It's part of the House of Clocks, an occasionally open tourist attraction of old buildings and hundreds of antique clocks. According to the House of Clocks brochure, it's a replica of the World's Smallest Methodist Church (no info as to where, exactly, that is) and has been used for several marriages. Pretty darn tiny -- maybe 6 ft. x 6 ft.
Lebanon, Kansas: The Geographical Center Chapel may not be used for services, but we let that requirement slide due to its proximity to the important "Geographical Center of the 48 States" Monument. The white, wooden chapel is about 6 ft. x 7 ft. A handwritten sign explains the chapel's purpose is to "give you a special place to pause for a few minutes of worship." Behind the lectern, under the words "Pray America," are painted stars and stripes in the shape of the 48 states. A wooden cross is nailed over Kansas. Crestview Hills, Kentucky: The Monte Casino chapel measures six by nine feet. Built in 1878 at a nearby monastery by Benedictine monks,it was named in 1922 by Ripley's Believe It of Not as "Smallest Church in the World." The monks subsequently left the area, in 1965 it was moved to the Thomas More College campus and restored. Point Pleasant, Louisiana: At 8 ft. x 8 ft., with five chairs, it was once illustrated in Ripley's Believe It of Not. It was built in 1903 by Anthony Gullo, a poor sugar farmer, after he successfully prayed to the Virgin Mary for the recovery of his eldest son. Mass is held once a year on August 15 to celebrate the Assumption of the Blessed Mother. 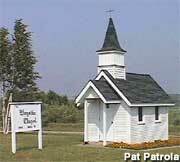 Atwood, Michigan: The Wayside Chapel, owned by the Christian Reformed Church in Atwood, was built in 1968. It measures 12 ft x 8 ft and is occasionally used for weddings, etc. but is mainly intended as a rest spot for travelers. It is lit and open to the public 24/7. Luverne, Minnesota: The Blue Mound Wayside Chapel seats six to eight people, plus a minister. A small herd of buffalo reportedly loiters in its postage stamp-sized shadow. Mt. Vernon, Missouri: Shepherd's Field Wedding Chapel is presumed to be the Smallest Chapel in use in the state of Missouri. 6'x10' outside dimensions, holds wedding party of 10 semi-comfortably. North Woodstock, New Hampshire: Rock of Ages, tiny church perched on a rock, holds 12 1/2 people when fully packed. 11 ft. x 11 ft.
Winslow, New Jersey: On the front lawn of a devout Catholic lawn landscaper. Not an official church. Dummies dressed for an infant-Jesus-in-the-manger scene populate it; its interior is sealed by a floor-to-ceiling sheet of Plexiglas. It seats eight. Great Valley, New York: Completed in Oct. 2006. Size is 6 ft x 10 ft. Tipster Sherri writes: "Small church located in the side lawn of a residence. Looks like a child's playhouse." But not so small that it didn't find wall space for an air conditioning unit. Oneida, New York: We think it just might be the One. Cross Island Chapel, "The World's Smallest Church," sits on a wooden platform in the center of a pond, accessible only by boat. A billboard near the road details everything you need to know: "Built in 1989. Floor area 51 inches by 81 inches (28.68 square feet). Seats two people. Non-denominational. Dedicated as a witness to God." St. Mary's Pennsylvania: Once billed as the "Smallest Church in the U.S.A." on an old vellum post card, Decker Chapel was built by Michael Decker in 1856. It still stands on the main drag through St. Mary's across from the Wendy's. Ardmore, Oklahoma: The "Tiny Chapel" has room for an altar, a one-person lobby, a center aisle and two sets of single person pews. When you close the door, music is automatically piped in. Conway, South Carolina: The Traveler's Chapel, 12 x 24 feet, built in 1972. Seats 12 people. Write your requests in a book. White Lake, South Dakota: Sunday services are occasionally conducted for passersby at Wayside Chapel. Constructed by members of a normal-sized church in Corsica, the exterior is roughly 8 ft. x 10 ft., with three rows of chairs and an altar. An identical chapel stands on the other side of I-90. Warrenton, Texas: St. Martin's Church is 12 ft. x 16 ft., and has been proclaimed the "World's Smallest Active Catholic Church." Not by us, though. Built in 1915 with leftover lumber from a school construction, it holds 12 wooden pews and seats about 20 people. A yearly service is held on November 11th - All Soul's Day. Elbe, Washington: The Evangelische Lutherische Kirche, aka "The Little White Church," measures 18 ft. x 24 ft. and seats a whopping 46. It was built by German settlers in 1906, and enjoyed a classification by Ripley's Believe It or Not as the "Smallest Church in America" (titles such as this, handed out decades ago, litter the tiny church landscape and cause no small confusion to pilgrims). Sultan, Washington: The Wayside Chapel. "Pause... Rest... and Worship" encourages the sign in front of the always-open Wayside Chapel. Wayside Chapel is approximately 7 ft. x 9 ft. -- just room inside for four small, two-person pews, a pulpit, and two vases of artificial flowers. Horse Shoe Run, West Virginia: "Our Lady Of The Pines" is promoted on old postcards and signs as the "Smallest Church in 48 States." Seating for 12, 24 ft. x 12 ft.
Niagara-on-the-Lake, Ontario: Reported as less than 10 ft. x 10 ft. Doors always open.